Emma drew this picture of me a few days ago, and as I looked more closely at it, I thought, "yup, pretty accurate." Well, except for the detail of two children swimming around in my tummy….But otherwise, feeling huge, sporting some puffy hands and a dark hole of a belly-button. I never get that cute little out-y belly button when I’m pregnant, instead mine turns into a giant dark crater. However, it has become the megaphone between my children and the baby, so I guess I shouldn’t complain. But I do appreciate that Emma gave me a pretty good hair day in this picture, a smile and pretty slim legs…but if I was wearing a pair of maternity jeans that I was constantly tugging back up to my waist, then it would be really accurate. I went to the paint store over the weekend and picked out some colors for the baby room. Standing in front of that wall of paint chips–I realized again that I really like color–lots of colors. But I had something in my head and I came pretty close. 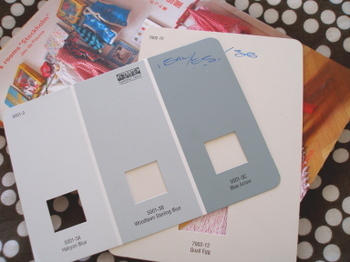 I also realized that I’m influenced by the names of the colors: "quail egg" is what Dan is going to paint the baby crib. I love the color and I really love the name. Our crib is a hand-me-down and has now been in service for probably five children. The wood is definitely ready for a refresh. I probably could have stayed in that paint section for an hour or two just watching other people make their painting decisions. I watched a pair of teenage girls who were picking out bedroom paint, pull shades of color off the wall that looked more like streetwise lipstick shades than a color you’d want to be surrounded in while you slept. And a husband and wife pulling out card after card of taupes and orangey-tans, looking for a color to match their living room carpet. I think they should consider hiring paint counselors, stationed around the color chips. I’d volunteer. that picture is hilarius. You know children are much smarter than we are -are you sure there aren’t two in there?!? Let’s hear it for the never-ending pregnancy belly buttons – amen sister! Love those colors you picked. I love how one of the babies in your tummy is wearing a hat or has a very tall hairdo. I’m in need of the counselling service for sure. Quail egg. I love it. Funny how quickly you forget about maternity clothing woes! I forgot all about the fact that the jeans are prone to slipping! Thanks for the reminder! I am completely useless when it comes to color. I know what I like once it’s painted, but paint chips? I’d be the one picking totally tacky colors & then regretting it. I would greatly benefit from a color consultant. BTW! I have that Paumes book and LOVE it!! I totally love that Emma drew such sweet smiles on everyone in her picture. Oh Molls, I know how you feel. Baby will be here soon–and as you already know, it is all so worth it! xo. Quail egg, yes. That’s the one. And LOVE Emma’s drawing. Goodness, you’ve almost made it! This post cracked me up. Firstly of course the awesome drawing! I also have the blackhole belly button and since this is my first, I was curious as to why it wasn’t just popping out like everyone talks about…nope, it’s just dark. And I must have the same maternity jeans you have because I am constantly pulling them up. It makes me crazy. Let’s hear it for round ladies with blackhole navels and saggy jeans! I love children’s drawings when they’re this age…so pure and simple!